If you hang out with enough marketing types, and I certainly do, you'll start to hear the term 'brand' an awful lot. When we refer to brands we aren't just talking about the McDonald's and Burger Kings of the world (clearly I am writing this post pre-lunch). You'll hear marketers talk about business brands, product brands, personal brands and so on. 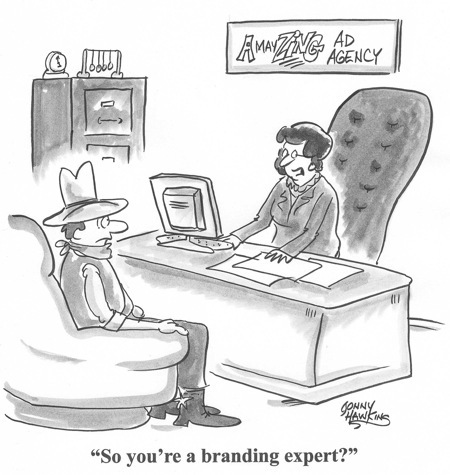 Many marketers go around branding things like some sort of crazed cowboy. That being said, there really is a lot to be learned from branding. And believe it or not, brand strategy can help you further your career as entertainer. We'll tell you how, but first a quick lesson. Wondering what exactly a brand is? It's an elusive concept but here's a simple definition I like: A brand is the sum total of the images, ideas and experiences people have regarding a company, product, person, etc. The McDonald's brand isn't just their golden arches logo or their "I'm loving it" slogan. It's what we (you, me and everyone else who is aware of the company) collectively conjure up when we think about McDonald's. And what we think of McDonald's is based on our prior experiences at their restaurants and with their advertising, public image, etc. Here's why you should care about the concept of a brand: if you're a musician, comedian, clown or any other type of professional entertainer, like it or not, you already have a brand. Your brand exists whether or not you do anything to manage it. So, it's time to start managing it. Be Consistent - Do all the photos on your Profile look like they come from the same performer? Are they up to date? Are you using the same logo on GigMasters, your personal website and your merchandise? Hopefully the answer to all of these questions is a resounding 'yes.' You don't want your potential clients thinking you have multiple personalities (unless that's part of the act). Work on cultivating a single consistent image. Be Nice - As an entertainer, particularly one who plays private events, you are in the Customer Service business. Make it a point to be friendly, polite and outgoing to everyone you come across at gigs. People talk, especially guests at a party. If you are rude to one guest, you better believe that the rest of the party is going to hear about it (not to mention the client who will be reviewing you post-gig). Be Accessible - Yes, social media and blogs are fun and great for promotion, but they're also a great way to connect with fans. Just remember, your tweets and status updates live forever and you never know who will see them - so always refer to tips one and two before you send that tweet. Be Different - There are a lot of brands out there. What's special about yours? Don't let this question fool you. If you believe in yourself and your talent, that's enough to differentiate yourself from the crowd. Be You! - Bottom line: you are your brand. You're an entertainer, you do something unique and interesting. So be an interesting brand! Unlike McDonald's, you don't have to worry about keeping millions of employees and thousands of stores consistent with the brand. You just have to worry about you...and maybe your crazy bandmates. Our friends at CDBaby pointed us to this Branding Yourself as a Musician checklist. It's a great read with some specific ideas about merch, websites, logos, etc. Want to learn more about branding from some of the biggest brands in America? I highly recommend the book 'The Best of Branding: Best Practices in Corporate Branding' by James Gregory. Last but not least, a helpful post about branding from Seth Godin.